The Southern Poverty Law Center issued a misleading and politicized report on hate groups for the purpose of smearing those who oppose Democratic Party plans to expand government. This has become an all too common SPLC tactic, and is a disgrace because there was a time when SPLC actually went after hate groups rather than simply putting the label "hate group" on law-abiding political groups which happen to oppose SPLC's fundraising base. By conflating political opponents with almost extinct groups like the Ku Klux Klan, SPLC creates powerful, but distorted, imagery. SPLC's report caused the The Guardian in Britain to run the image at right on its homepage to highlight the SPLC's report. Your mission to smear all opponents of the Obama agenda as the equivalent of Klansmen is on the way to being accomplished. William, the real problem withe the spin by the SPLC is that the KKK is an arm of the Democrat Party. The KKK is left wing, not right or centre. Perhaps we should be writing to The Guardian and explaining the history of the KKK, especially its ties to the Democrats, and how they used the KKK to chase way the blacks from voting Republican. Then pointing out how it was the Democrats that removed the right to vote away from the blacks. spondy is right. KKK's origins are leftwing. As for those of us on the right, especially Tea Partiers, we derive much inspiration and motivation from these slanders. Which means they backfire on the slanderers. It's published in the UK? I wonder if a libel suit can be maintained there. The Guardian (a leftist British rag) must have removed the picture from the article - Glenn Beck is pictured at the link. It is good to read, Peg, that the Tea Partiers see these slanderous hits as inspirational. This is Alinsky-style tactics in action, so it won't stop soon. Thanks again, Prof. Jacobson, for bringing truth to light! 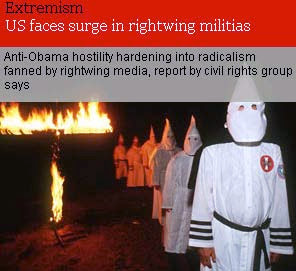 "... the rapid increase in rightwing extremist groups is a partly down to government conspiracy theories ...."
"The Tea Parties and similar groups that have sprung up in recent months cannot fairly be considered extremist groups, but they are shot through with rich veins of radical ideas, conspiracy theories and racism," the report says. The constitutional limits on the federal government - what a radical idea! @DINORightMarie - the image I posted was from The Guardian's home page which linked readers to the article; the image was not part of the article itself. Perhaps I should have made this more clear. In some ways, putting the image on the home page was worse, because all readers saw was the image of Klansmen and the mention of Obama opponents, without even seeing the text of the article. A more subliminal smear. (D)emocrats who seceded to perpetuate slavery. (D)emocrats who fought to perpetuate slavery. (D)emocrats who founded the KKK, see serving Senator and KKK Kleagle Byrd(D). (D)emocrats who implemented and enforced Jim Crow Laws. (D)emocrats who implemented and enforced Segregation. (D)emocrats who blocked the doors of the schools. (D)emocrats who get 95% of black votes.